March 12th, 2011 by KTU | Filed under 6. Interior Materials and Finishes, Notes on Approaches, Park City Mountain Modern. 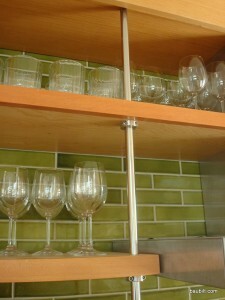 Detail of shelf hardware. 3/4" stainless tubing with shaft collar. You need some tubing, some clamp collars, tube connecting nuts, and hanger bolts. I’ll show photos and then provide suppliers at the end. A 1/4-20 hanger bolt...lag screw on one end and machine screw on the other. Screw this into the ceiling (planning ahead for blocking where you want to hang the rods). 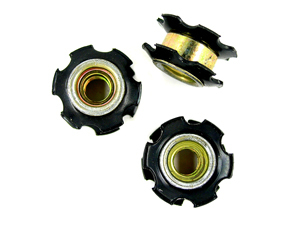 A tube connecting nut, also known as a star nut. You press this down inside your tubing. You need to buy the right size to fit into the tubing. Thread a bolt into it first and you can tap on the bolt with a hammer to insert it. Once the nut is inserted in the tube, you can just screw the tube up onto the hanger bolt until it is tight against the ceiling. A double-split clamp collar. You clamp these on the tube where you want your shelf to hang. Tubing: I used 304 Stainless Steel, which runs about $9/ft for the polished seamless version or $3/ft for the plain-finish welded-seam version (which looks “satin” and is perfectly nice). You can, of course, use plain steel, which would be really cheap. I used 3/4″ diameter with 0.049″ wall thickness, which is quite standard. You can order it from McMaster-Carr. 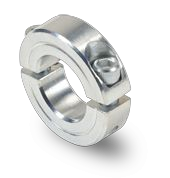 Double-split Clamp Collar: I bought these from McMaster in stainless. These are pricey…about $10 each. The plain steel ones are about $4 each. A set up with two 36″ rods and 4 clamps in stainless steel would cost about $70 for the hardware ($100 if you use the polished tubing). In plain steel, it would probably cost about $30. I used the hanging rods for just the front support. 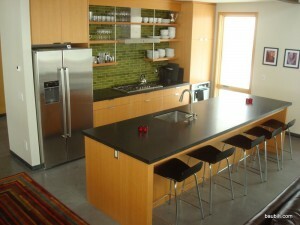 In most cases, my shelves were 1-1/2″ thick (2 sheets of 3/4″ plywood). My finish carpenter routed a 3/4″ dado in the back and side edges of the shelves. He nailed or screwed a 3/4″ wide cleat onto the wall and then installed the shelves over that cleat, holding them in place with a few finish nails. I had the same idea for my living room audio/video module, but found the stainless collars a bit pricey… especialy that I needed 20 of them! Instead I’m going with wood pucks that I will drill through and then use an insert and a bolt. I will have to drill through my tubes as well, but they are aluminum (proud Quebecois!) and thicker (120 mil) so it should’nt be a problem. Can send you pictures if you wish. You might consider using an aluminum shaft collar. McMaster has them for about $3 each, and you can get them cheaper elsewhere I’m sure. Those aluminum tubes will oxidize to a darker gray over time. You can clean them up before installation with a green Scotchbrite pad — when “brushed” with the pad, the surface looks nice and uniform, and the natural finish lasts a bit longer. love it! How much would this hold? I want to use this with a heavy live cut piece of wood shelf. I think the limiting factor would be the pull-out strength of the star-nuts that you press into the ends of the tubes. My guess is that they pull out of a 3/4″ stainless tube at 200 – 500 lbs. That would be per tube. You probably get higher values for plain steel tubes and lower for aluminum tubes. Still, you’re likely good for a couple of hundred pounds of load per tube, which would be quite a lot, especially given you are likely supporting the back edge with a wall. and what do you do at the bottom last shelf ? just the clamp collar? would that hold ok too? no slipping? Yes, that last clamp will have a lot of strength — a few hundred pounds, most likely. I’m curious if this will work free hanging (without a wall behind). So for instance, could I use this method to have a free-hanging shelf with 4 tubes? How strong would this be? I plan on screwing the hanger bolt into beams in the ceiling. Should work fine. However, there is no cross-bracing in this design, so the shelves may wobble a bit when nudged. 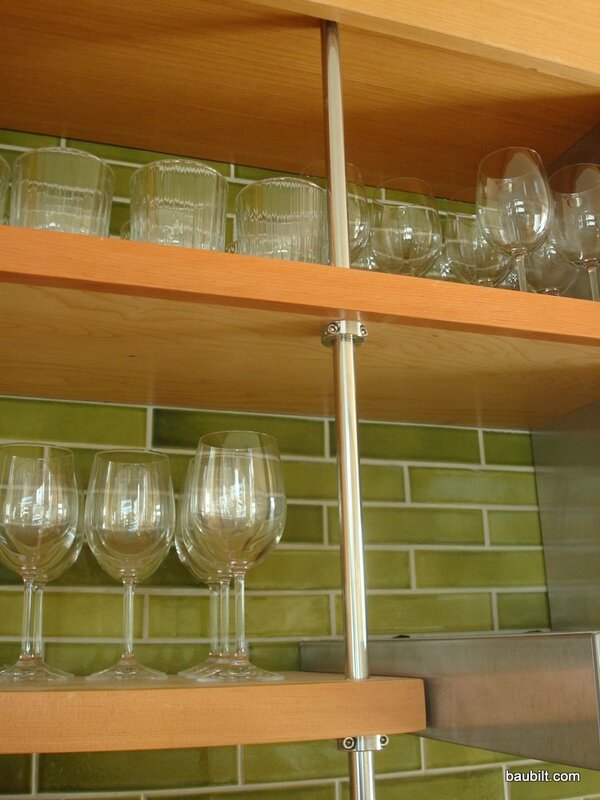 Probably not a great design for a shelf to store champagne flutes. I believe each star-nut inserted in a 3/4 tube will support a couple of hundred pounds, so unless you are planning on storing your rock collection, the strength should be fine. We are planning on following your plan, but there is one thing that is not addressed – a covering for the end of the tube. Our shelf would only come down a few feet from the ceiling. As a result, the end of the tubing would show. How would we finish off the end of the tubing so there is not just an open tube showing? Thank you. I will pursue your leads.